Texting Lanes: April Fool's Joke a Harbinger of the Future? Sidewalk lanes for the digitally distracted may have been a joke, but officials in Philadelphia want the public to know the issue is no laughing matter. Lines on some sidewalks near Philly's City Hall are now designating part of the pavement as "e-lanes" suitable for chronic texters and digital music aficionados -- although only through the end of the week. 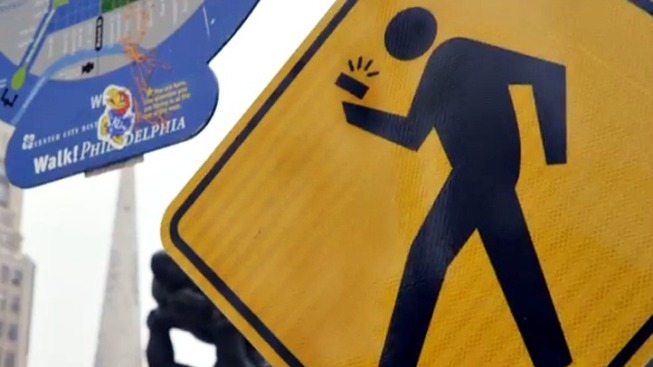 The April Fools' Day prank is one way city officials, in particular Philadelphia Mayor Michael Nutter, are trying to draw attention to the danger of inattentive pedestrians. The lines, signage and sidewalk graphics -- depicting a pedestrian peering down at a hand-held device -- will stick around part of John F. Kennedy Boulevard through the week. "Sidewalk safety is important," Nutter noted just after his mock interview was disrupted. The video also features a rowdy band of anti-texting protesters. All kidding aside, officials said distracted pedestrians are a serious issue the city plans to address. Here in D.C., the Council for Court Excellence is calling on city officials to ban the usage of electronic devices when crossing the street.